Overall Campark 14MP 1080P is a high-quality trail game camera at a surprisingly small price. First to say it has a premier camouflaged design. Secondly, the camera is very easy to set up, not to mention there are multiple applications for you to pick from. About the quality of images and videos, I'm very impressed by its night vision capabilities. I write this Campark Trail Camera review to share with you guys some practical experiences so that you can make an informed decision to invest one of the most essential hunter’s arsenals. Even if you want a camera for wildlife monitoring, farm monitoring, or home security, this article is also your must-read. Campark brand provides a wide range of professional cameras for you to pick from, yet as mentioned, we will pay attention to Campark Trail Game Camera 14MP 1080P Night Vision Waterproof Hunting Scouting Cam – the top choice regarding its high-quality features and its mid-price range. All information is based on both my practical experience with the Campark camera as well as the analysis on hundreds of customer reviews from online stores, especially on Amazon. This camera surprises me by its fast trigger speed of 0.3 seconds and its full-HD 1080P videos and 14MP resolution crystal clear pictures. Because of the small size and solid design, the camera is very easy and convenient to configure and work with. Not to mention, the price is small and affordable with almost all hunters. Now, let’s get insight into some highlight features: what is good and what to improve. One thing I like about this Campark camera is that the size is not too bulky with solid construction. On the front side, you can see a 42 IR LEDs and three infrared motion detectors, making it possible to broaden its detection zone up to 20 meters. The convenient LCD screen is also a nice addition to view pictures and videos easily and clearly. Whereas, there is a basic strap to hook the camera firmly on the backside. That way, it is easy to handle and tied to trees or other places with accessories. Plus, like other trail game camera, the Campark has camouflaged color so most animals can not notice them. Just a fun warn, but with such a nice and small design, even you might forget which trees you have tied it on. So be aware. Moreover, the waterproof and dust-proof feature will ensure the Campark Trail Game Camera works well even while it is raining. It will improve the camera durability. Besides a nice design, the high-resolution camera of the Campark also earns loves of hunters. Detection Zone: It is advertised that the camera will detect any movement and single animals that walks within 20 meters (equivalent to 65ft.) What’s more, the 120-degree detection feature is essential to enjoy a broader view rather than a linear trail. Based on my test, the quality of images and video is 90% reliable at about 60 ft while if it is 90ft and more away from the camera, the reliability reduces to 15%. To sum up, the detection zone of Campark T45 is surprisingly broad. Trigger Speed: The fast 0.3s trigger makes this trail game camera outstanding from other competitors. It means the camera will detect any motion once it reaches its vicinity, then capture images or videos within 0.3s without delay. That way, it frees you from worry about missing exciting moments or animals even at night. Image and Video Quality: As mentioned, the images are high-quality with 14 MP clear crystal technology so that you can see the vivid wildlife, both in daytime and nighttime. The motion sensor is so sensitive that the camera can capture even small objects. Even more, 3 of Passive Infrared Sensors (PIR) and 42 pcs LEDs creates excellent and clear night vision while consuming very low power. Though the Campark does not support 4K resolutions like some other trail game cameras, the full HD 1080P is clear enough to capture the lively world of the wildlife. 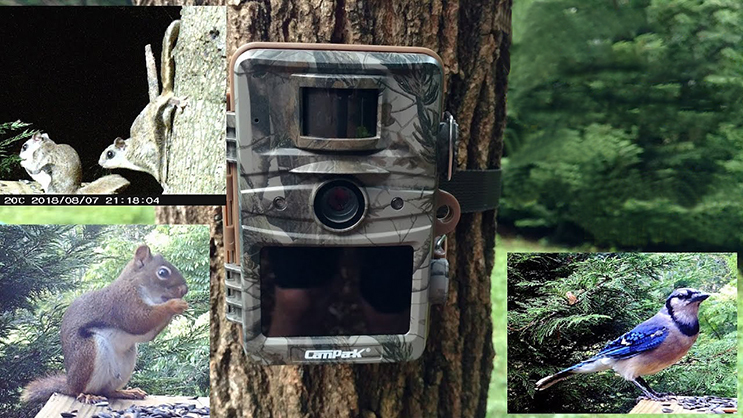 Almost all customers gave positive feedback that Campark Trail Camera is user-friendly which is easy to set up and get going with plenty of options. The menu is very straightforward to navigate and all modes are simple to understand even when you have first time used camera trail. Please note that the package of Campark Trail Game Camera T45 does not include battery and MicroSD. So you must invest these two components yourselves. My recommendation for the battery is 1.5V AA battery*8. The camera also supports External DC 6V power supply, but at least 1.5A. Overall, the battery life of Campark T45 is good and can be lengthened by choosing different settings wisely. This camera supports up to 32 GB MicroSD cards so you use can save a large volume of pictures and videos in one go. Just remember that you should format memory card before using it for the trail camera to ensure all will work well. One more thing is that handling the microSD might be hard since it is small and easy to drive you into fidget, especially in cold. Above is the Campark Trail Game Camera review and I hope that with such information you can make an informed decision on this helpful tool – trail camera. In case you are fully ready to buy one for your 2019 hunting games, feel free to check it out on Amazon.